ISSN: 1531-6505; Issue 44 - Subscribe Free! One of most often asked questions I receive is "how can I improve the performance of my PC in terms of running music software?" My answer is that there are three basic things you can do... 1) Upgrade to a 64-bit version of Windows, which runs more smoothly and efficiently than 32-bit. This is especially true if you're running all 64-bit software as well. Just be sure that you have 64-bit drivers for all your hardware. 2) Increase the amount of RAM in your PC. Windows likes to have "room to breathe" and more RAM can definitely help performance. 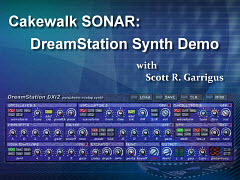 It will also allow you to run more fx and synth plug-ins (if you like to use a lot of them in your projects). 3) But even if you decide to stay with 32-bit Windows and run no more than 2GB of RAM, there's still one important thing that every user should do... put your files on different drives. By this I mean that you should use at least three drives in your system: Drive 1 for OS and software/plug-ins; Drive 2 for project/audio files; and Drive 3 for streaming sample libraries. Some users go even further by putting the OS on a separate drive for a four-drive system. This actually makes it easier to do backups, but not entirely necessary. The basic reason for doing this (and why using multiple drives will improve performance) is that the computer can only read one stream of data from each drive simultaneously. So if your software needs to read project/audio data and synth samples from a single drive, it impedes performance. What about partitions? Will they work instead of separate drives? No. Partitions are great for organizing data, but they don't do much for performance because while the data may be in separate sections of the drive, it's still all on one drive. One other quick and easy upgrade you can do to provide a very significant boost to PC performance is to upgrade some (or all) of your drives to SSD. Yes, they are still expensive when compared to HDDs, so I recommend that you start off with one and upgrade over time (unless you have plenty of money to spend). My main use for SSDs is for streaming sample libraries and the boost in performance over HDDs is significant. I'll talk more about SSDs in future issues as well as in our sibling publication, NewTechReview: http://www.newtechreview.com/newtechreview/. You can also check out a video showcasing my current DAW PC (before any upgrades) - rackXT DAW PC Inside Look: http://www.digifreq.com/digifreq/video.asp?ID=5. In the meantime, if you have questions or want to talk more about this topic, feel free to join us over in the DigiFreq Forums: http://www.digifreq.com/digifreq/discuss/topic.asp?TOPIC_ID=6349. If you don't already have one, get your free forum account at: http://www.digifreq.com/digifreq/discuss/policy.asp. Thanks so much for reading DigiFreq! Now lets kick off this issue with Miking Solo Instruments (Part 2)... Enjoy! This article is also a continuation of Miking Solo Instruments (Part 1). Depending on the instrument, you can have problems if the musician moves the instrument around while he plays. This can cause any phasing or comb filtering to draw attention to itself as the distances between the sound source and the mics change with the movement. Also, the instrument will lose its center as it moves between the pair of mics. (Or perhaps that's what you want.) A shifting center is most obvious with small instruments (such as handheld percussion, flute, recorder, and so on), where the mics are closer together and nearer to the sound source. 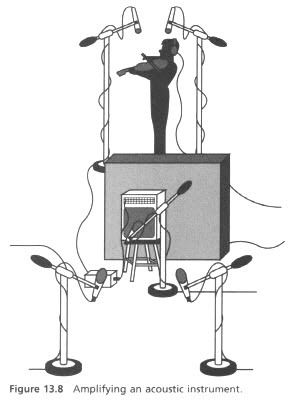 If this is happening, mark the floor with an X and give the musician a target to play toward by positioning a third mic 2 to 3 feet in front of the performer and between the microphones. Position it at a comfortable height for where the performer holds the instrument, and don't bother to plug it in (unless you just want to be wild and crazy). Microphone selection will vary depending on the instrument, but the suggestions in previous chapters will apply. I've also added a few extra ones. For instruments that have a higher musical range, I would usually choose a brighter small-diaphragm condenser mic, such as an AKG 451, Neumann KM 84 or KM 184, Studio Projects C4, Berliner CM-33, or Oktava MK-012. I think the Samson CL2 is also a very good value. For a richer low end, I like larger-diaphragm condensers, such as the Neumann U 87, AKG 414 or 214, Oktava MK-220, AKG C 12, Telefunken Ela M 251, RODE Classic II or NT1000, or a Groove Tubes MD1b. If the mic had selectable patterns I would most often go with a cardioid pattern, but the choice of patterns will be decided based on how much of the room I want to include in the sound—I'd use a cardioid for less room and an omni for more room. It's also worth a reminder that when many cardioid mics are close to the sound source, there is a proximity effect that enhances the low end. This can be desirable or not, depending on the sound. If the solo is a precise part, doubling (recording two identical solos) may create a fuller sound. In the mix, over-balance the two stereo recordings of the doubled solo. In other words, one of the solos will have its stereo pair with the right side slightly louder than the left, and the double will have its left slightly louder than the right. This technique creates a solo that is larger than life. This technique isn't appropriate for everything, as doubling some parts causes them to lose their personality, but when it works, it can be very effective. Sometimes, the sound of a traditional acoustic solo instrument, such as a flute, violin, or harmonica, can be enhanced by miking it; connecting the mic to a guitar amp (or a Leslie cabinet), usually through a transformer direct box or reamp setup; and miking the amp (see Figure 13.8). In this case, the acoustic violin is miked in stereo, and the amp has a pair of mics a few feet from the amp as well as a mic up against the grill cloth. The amp would most likely be placed in another room. DFreqDEALS - macProVideo Electric Guitar Production Video Tutorial - 20% off! Eyal Amir is back with a new song and new course. Collaborating with virtuoso guitarist Alon Tamir, Eyal takes you through all the innovative guitar techniques he used to produce his latest tune: Deal With It –which Eyal wrote specifically for this course. See how to build solid rhythm tracks. Learn how different picking techniques can be used to create effective musical expression. Watch Eyal and Alon collaborate on creating overtones, melodies, arpeggios, solos and more while they explain their Outside The Box production techniques. Most of all, see how Eyal –in his imaginative way– weaves all of these various guitar sounds into an inspiring musical fabric. Groove Monkee Releases Country 2 - MIDI Drum Loop Library - Get 10% off! Drums On Demand releases Contemporary Radio Ballads Drum Loop Library - Get 10% off! 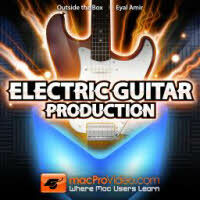 macProVideo Releases Electric Guitar Production Video Tutorial - Get 20% off! Adobe Audition & others for Free - Legit! USB mic - more than one? DFreqFINISH - Are You Selling Your Music MP3s Online? These days independent musicians have a lot of opportunities to sell their music online. Just like the famous musicians, anyone can get their music on to retail sites like iTunes, Amazon, etc. The problem is that many of these sites (like iTunes) don't allow direct submissions. Instead, you need to use an aggregator. An aggregator is a company that takes your music and submits it to all the various online music outlets for a fee. They also collect any money from sales and then pass that money (or a percentage of it) on to you. Some of these companies include CD Baby, Tunecore, and Routenote. They all have their strengths and weaknesses and I'm still trying to decide which one is best for my music. So we're currently having a discussion about it over in the forums. Are you selling your music online? If so, what service are you using to do it? Join the discussion at: http://www.digifreq.com/digifreq/discuss/topic.asp?TOPIC_ID=7067. If you don't already have one, get your free forum account at: http://www.digifreq.com/digifreq/discuss/policy.asp.